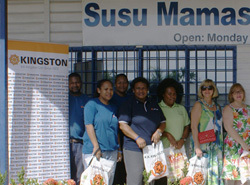 Every year on Mother’s day weekend, Susu Mamas Inc with the support of business corporations and partners give away something special to the mothers at the Port Moresby General Hospital maternity wards. This year and for some time now KK Kingston Limited and Goodman Fielders together with value added support from Ramu Agri Industries and Paradise Foods Limited have come good with a very bold donation of over K10 000 worth of household cleaning products and food items to mothers at the postnatal, delivery and special care nursery wards. This initiative was taken by the Susu Mamas Ball Committee eleven years ago to recognize mothers and put a smile on their faces during Mother’s Day. Apart from the mother’s day donations, the Ball Committee also raise funds to support Susu Mamas Inc through various fundraising activities. In 2014, the committee raised a record-high K400, 000 during a ball. The money raised was put to purchase much needed equipment for the hospital. “We recognize that Susu Mamas carry out such an important work in PNG and we hope that this little support will go some way to assist their efforts,” said KK Kingston National Marketing Manager, Christopher Elphick.